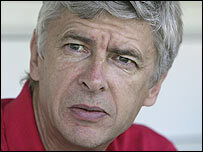 Arsenal boss Arsene Wenger hailed his side's attitude after coming back from a goal down to beat Hamburg 3-1. Late goals saw Arsenal climb to top of Group G with one round left to play. "They scored a great goal and this time we couldn't do a lot about it," said Wenger. "After that I feel we've shown great character, great spirit. "We were 1-0 down at half-time but we hit the bar, we made a few changes and it worked out. Overall it was a great team performance." Rafael van der Vaart had put Hamburg ahead in the fourth minute but the Gunners came to life after the break with strikes from Robin van Persie, Emmanuel Eboue and a first for on-loan Brazilian Julio Baptista. "Unfortunately, we always concede and have to fight against 10 men defending," said goalkeeper Jens Lehmann. "We worked hard and we've got what we deserved. It was a vital win for us." Arsenal head to Porto next month, knowing only a draw is needed to claim their place in the knock-out stages of the tournament. But last season's runners-up will have to travel without suspended Thierry Henry, after the talismanic striker picked up a third caution of the competition on Tuesday. "That's unfortunate but we know that it will be a good game for us and I'm confident we can do it," added Wenger. "He was frustrated because his shirt was held a lot. There was a lot of unfair play against him, he got a little bit frustrated."